I've mentioned that you should only pet your dog when he is either sitting or lying down. Now, using the approach I've just introduced for "sit," teach your dog to lie down. You will be a statue, and hold something he would like to get but that you'll only release to a dog who is lying down. It helps to lower the desired item to the floor in front of him, still not speaking and not letting him have it until he offers you the new behavior you are seeking. 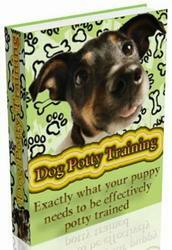 Lower your dog's reward to the floor to help him figure out what behavior will earn him his reward. He may offer a sit and then wait expectantly, but you must make him keep searching for the new trick that triggers your generosity. 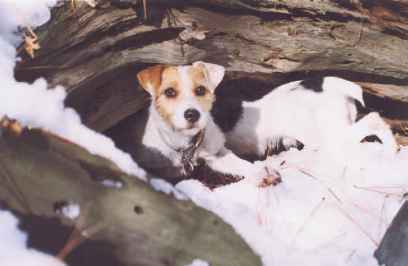 Allow your dog to experiment and find the right answer, even if he has to search around for it first. When he lands on "down" and learns it is another behavior that works, he'll offer it more quickly the next time. Don't say "down" until he lies down, to tightly associate your prompt with the correct behavior. 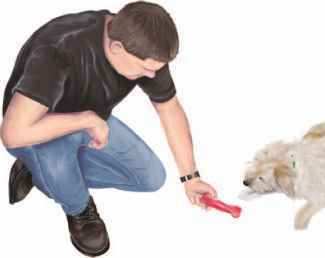 To say "down, down, down" as he is sitting, looking at you, or pawing at the toy would make "down" mean those behaviors instead! Whichever behavior he offers, a training opportunity has been created. Once you've attached and shaped both sitting and lying down, you can ask for both behaviors with your verbal prompts, "sit" or "down." Be sure to only reinforce the "correct" reply!